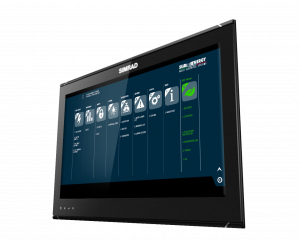 NAVIOP, a leading company in marine monitoring and control systems, belonging to the NAVICO group, always attentive to the environment, created MyGreen, an agile software necessary to have a correct code of conduct in presence of cetaceans and to report sightings. MyGreen is integrated on the Simrad MO19-T, widescreen displays that combine the best view in an elegant design for yachts and central consoles. In the Mediterranean there are 8 diﬀerent species of cetaceans and, for those who go by sea, it is important to know and put into practice a careful code of conduct In order to contribute to their protection, sightings can be reported to Tethys, a non-proﬁt organization dedicated to the conservation of the marine environment. Marine mammals are now threatened by many dangers: pollution, noise, collisions, plastics, decreased prey, catches in the nets, habitat degradation. Even small boats can be a danger to the survival of these creatures. In presence of cetaceans it is therefore necessary to adopt an appropriate code of behavior, respect the rules of approach and report them photographing them to help the experts of Tethys, who since 1986 study whales and dolphins. 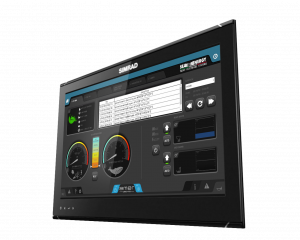 The MyGreen system, designed by Naviop, in collaboration with SeaEnergy, integrates a dedicated monitoring software on Simrad multifunction displays. 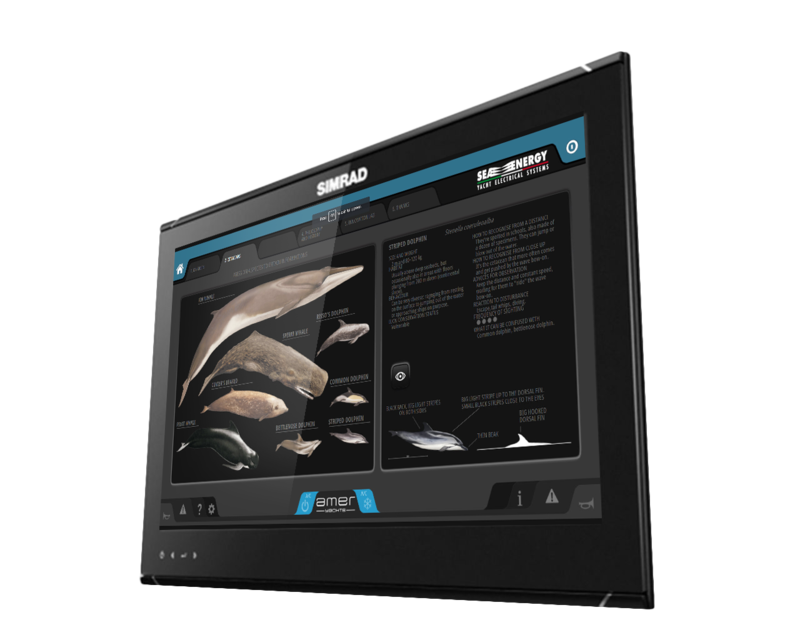 Simrad MO19-T are widescreen displays, 1000nit, that thank to the glass bridge design are able to maximize the visibility while minimizing dash space. MyGreen allows to know and adopt a correct behavior in the presence of cetaceans respecting the marine environment and to help identify and locate cetacean species, reporting sightings to Tethys experts. With MyGreen it is easy to respect the rules of cetacean feeding and help to report them. How to approach? At 300 meters away you must maintain a course parallel to that of the animal, do not approach it from the front or from behind, because the perception of the cetacean would be to be pursued. Do not approach less than 100 meters, unless the cetaceans are spontaneously approaching the boat. What is the speed to keep? It is necessary to keep the speed of the slower animal and, in any case, do not exceed 5 knots. In addition to the animals in sight there could be others nearby and not be visible on the surface. At 100 meters distance you have to stop the boat and put the engine in neutral, to be able to maneuver the vehicle if necessary. communications of cetaceans, never separate the animals from the group because especially the little ones would never survive without the mothers. Only one boat at a time can be within 300 meters of the group of animals. You have to leave the place to others waiting after 15 minutes. If they approach them? Avoid touching them, either with hands or with objects, because it is not safe and could be injured. Do not throw them food, because whales and dolphins feed only on some live prey, the rest would be harmful to them. Do not enter the water, it would not be safe and could be a source of stress for cetaceans. You do not have to aim for the group of cetaceans, if they feel safe they approach by themselves. Accessing from the drop-down menu of the MENU page, in the MYGREEN page, in the dial on the left, you can read the kg of CO2 that are put into the atmosphere, every hour, from the boat, in a sort of sensitivity index towards the marine environment . A second instrument indicates the speed of the boat and, with a semaphore scale, suggests the correct speed to keep in case of sighting. The biologists have found that under 14 knots drastically reduce impacts and collisions with large cetaceans and therefore it’s advisable to navigate under these speeds. A graduated scale summarizes the virtuous (or not) behavior of the boat user, both in terms of polluting emissions and sustained speed. 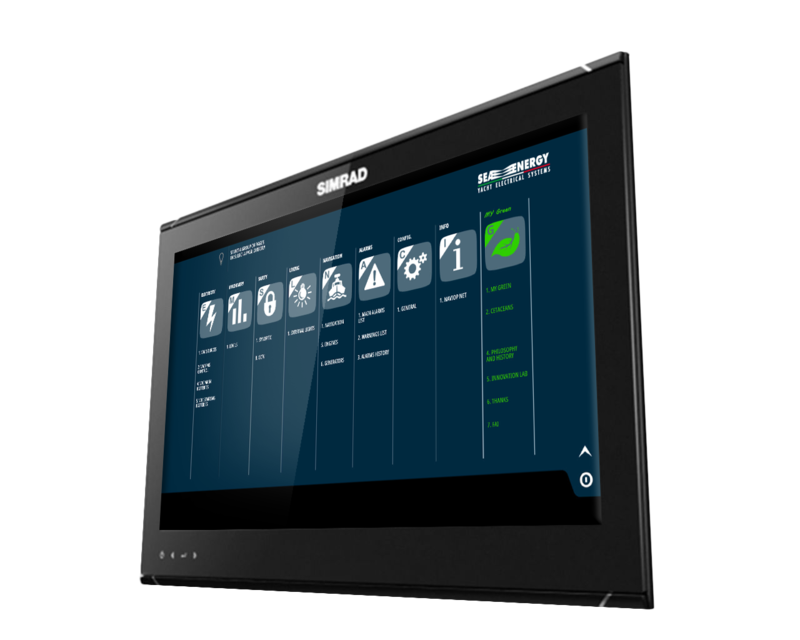 Another innovative function is a waste water facility to monitor the discharge of wastewater and to have indications of how to discharge them in respect of the environment and to have the GPS positioning of the discharge action. For the user it is a simple button that enables the automatic control system that prevents wastewater discharges below 3 nautical miles from the coast. It is hypothesized that this device, combined with very low displacement consumption, can in the future be adopted for safe access to protected areas.The system is completed by a memory of the records made, by the liters of discharged wastewater and by the indication of where, when and which cetaceans have been sighted. Finally, a synthetic menu highlights the environmental respect of the individual components of the vessel. On the CETACEI page, by pressing on the outline of one of the cetaceans represented in the abacus in the appropriate box on the left, a descriptive card with the particularities of the species appears on the right of the screen.By pressing the key below the descriptive card, the sighting is recorded in the event logger on the MYGREEN page indicating where, when and which cetacean was seen. Hardware, Software and Graphic Designer of MY Green page. 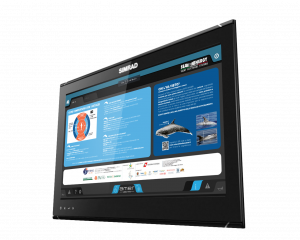 Sub-contractor of Marine Electronics of yacht. Data integration on MY Green page.